Symphysis pubis dysfunction (SPD), or now referred to as Pregnancy-related Pelvic Girdle Pain (PPGP), is very common. 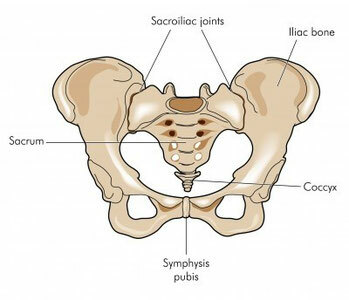 It is pain, caused by either too much or too little mobility in any of the three pelvic joints, the Sacroiliac joints (right and left) or the symphysis pubis. A 2011 review of the research found that between 16% and 25% of women report suffering from SPD/PPGP during pregnancy. Over the same large samples of pregnant women, they also found that clinically persistent SPD/PPGP symptoms were present from the post-partum stage to 2 years after childbirth, in 5% to 8.5% of women. Even now I still have patients coming to me who have been told it is normal to experience these type of problems and that they will go away after the baby is born but as you can see that is not always the case. In a perfect world, it is ideal if you can be fit with good muscle tone before pregnancy without any back problems, but we are not always in that perfect world! It is never too late to start though, core exercises are very useful and you can talk to a chiropractor, GP, midwife or other healthcare professional for advice on this. During pregnancy specialist yoga classes, taken from 12 weeks onwards, can be very beneficial. If you haven't done much exercise previously do not embark on a high end fitness regime. This is important pregnant or not, as you are always at risk of damaging your body if you push too far before your body's ready. Seek professional advice on how to build up slowly and achieve your goals. 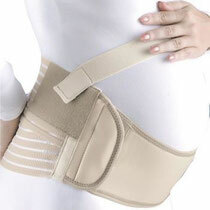 Specially designed supports and braces can be really useful in the later stages of pregnancy. They help to stabilise and reduce pressure on the joints, reducing pain. Long term use of these types of supports is not recommended, as one of the ways they work is to reduce the work the muscles have to do weakening them. Weakening of the core muscles in the long run and can lessen the body's ability to support itself and recover. For further advice on the type of support that's best for you and when to use it talk to your practitioner/midwife. Manual therapists can help patients with back and PPGP by mobilising loosening tight ligaments and muscles allowing stiff joints to move more freely reducing pain. Everyone's case is a little bit different so treatment varies depending on what the patient needs, and more important what is comfortable for them! There is no evidence to suggest manual therapy is contraindicated in pregnancy, and in fact there is good evidence to support its role in both pre and post-natal care of PPGP. In combination with exercise, function can be improved and even reduce back pain during the birthing process. Do pelvic floor and tummy exercises. Get down onto your hands and knees and level your back so that it is roughly flat. Breathe in and then as you breathe out, squeeze in your pelvic floor muscles and pull your belly button in and up. Hold this contraction for between five and 10 seconds, breathing through it. Relax your muscles slowly at the end of the exercise. Keep your knees together when getting in and out of the car, turning in bed, or bath. If you are lying down, pulling your knees up as far as you can stops your pelvis from moving and makes it easier to part your legs. If you are sitting, try arching your back and sticking your chest out before parting or moving your legs. Don't push through pain. If something hurts, if possible, don't do it. If the pain is allowed to flare up, it can take a long time to settle down again. Little and often, as you may not feel the effects of what you are doing until later in the day or after you have gone to bed. Sitting your hips should be above your knees. Birthing/exercise balls can help to reduce the pressure on the pelvis when sitting, but ensure it is high enough. If you are comfortable enough to do so, you can get down on your hands and knees to take the weight of your baby off your pelvis and back. Hold in a stable position for 10-15 seconds then slowly walk you hands towards your knees to help you upright. Do not do this if it is painful getting in and out of this position as you risk making the problem worse. Try not to do heavy lifting or pushing. Supermarket trolleys can often make your pain worse, so shop online or ask someone to shop for you. When climbing stairs, take one step at a time. Step up onto one step with your best leg and then bring your other leg to meet it. Repeat with each step. Swimming can be a great way to exercise as it reduces the weight on your joints, but do avoid swimming breaststroke and take care with the other strokes. Beware as you may feel swimming is helping your pain while you are in the water, but it could make you feel worse when you get out. When getting dressed, sit down to do your socks, pull on your knickers or trousers.